IU’s historic calliope is being brought back to life to help celebrate the university’s bicentennial, thanks to an IU Bicentennial Grant for a restoration project by the IU Alumni Association. Hoosier fans who attended the Indianapolis 500 parade, home football games or other events across the state in the 1970s, 1980s and 1990s will recall the calliope, a six-ton marvel of engineering whose 32 steam-driven whistles can be heard up to three miles away. "We’re so grateful for the support to restore this venerable instrument," said J T. Forbes, CEO of the IU Alumni Association. "It is an important part of IU’s history that will once again be roadworthy." 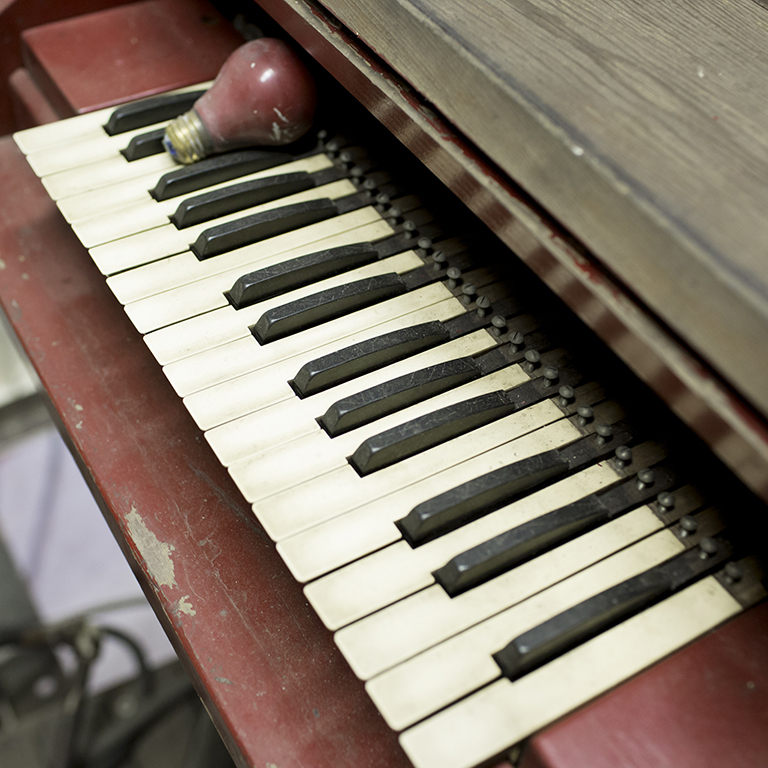 The instrument was rescued from the university’s showboat, "The Majestic," when it was sold in the mid-1960s. Before that, it provided musical accompaniment as the boat made its way up and down the Ohio and Mississippi rivers, welcoming patrons as they attended productions being put on by the IU Theater Department. The calliope languished in storage for a few years, and was brought back to life when the late Herron School of Art and Design professor Robert Weaver, himself a circus buff, designed and built a steel and wood circus-style wagon to house the instrument. It was towed by specially-trained horses who could withstand being so close to the earsplitting noise, or by truck. "At one time, the calliope went literally all over the state, to all these small town parades, football games on the Bloomington campus, the Indianapolis 500 parade and the city’s St. Patrick’s Day parade," said Stefan Davis, senior executive officer with the IUPUI Office of Alumni Relations, who is overseeing the current calliope rehabilitation project. "It’s probably been in storage on the IUPUI campus for nearly 15 years, but had had little work done to it in the last 50 years," he said. "Recently, there’s been some interest in reinvigorating the Bloomington campus’s homecoming parade and this was one of the pieces we thought might be good to have up and running again. In addition, with the university’s impending bicentennial celebration, it’s an opportune time to make it available to our regional campuses and other IU units. The original wagon was designed to help celebrate the U.S. bicentennial, and now we’ll have it refurbished in time for the IU bicentennial; all in all, it’s a great time to be working on this project." Work began in March, Davis said, and the restored calliope is expected to be unveiled in the IU Bloomington homecoming parade. Set to begin at 6 p.m. Oct. 14, this year’s parade route begins at 7th Street and Woodlawn Avenue near the IMU and follows Woodlawn Avenue north, including the upgraded stretch through the tailgating fields, to 17th Street. The restoration work includes adding Musical Instrument Digital Interface technology to the calliope, since it can be difficult to find a qualified instrumentalist to play it, Davis said. IU has three musicians it can call on now, including professor Darrell Bailey, part of the IUPUI School of Engineering and Technology’s Department of Music and Arts Technology. The calliope is being now housed in space in Indianapolis while the restoration project continues. The wood and plaster reconstruction work was done by Tim Puro and Jeff Stafford with Monroe Furniture Restorations. "The original wagon had a steel undercarriage and superstructure, but was clad in plywood that was rotting and all of the plaster moldings that had all disintegrated and were falling apart," Puro said. "What we’ve done here is a long-term fix. The only thing that would be more extensive would be to rebuild it from the ground up." Puro said he’s enjoyed being a part of the restoration project. Eventually, the circus-style wagon will boast a fresh cream-and-crimson graphics package, including candy stripes along the corners of the wagon, Victorian-style scroll elements and IU’s bicentennial dates: 1820 to 2020. "We often work on smaller artifacts that don’t get a large audience, so it’s been very interesting to be part of this process," Puro said. "I didn’t even know it existed. I can’t wait to hear this thing played. I’d love to see it all decorated and just step inside when it’s got a full head of steam and look around." He paused, then added with a chuckle, "Wearing a big set of noise-canceling headphones, of course. They told me this thing can be heard for miles."